Due to our fantastic audit carried out by Skills Development Scotland we were awarded additional fully funded places on our upcoming programmes. Places on our SVQ Level 4 programme have been filled! However, a handful of places are still available for our SVQ Level 3 programme. If you would like to develop your Site Supervisors then do not delay. Contact us today as recruitment is closing soon! 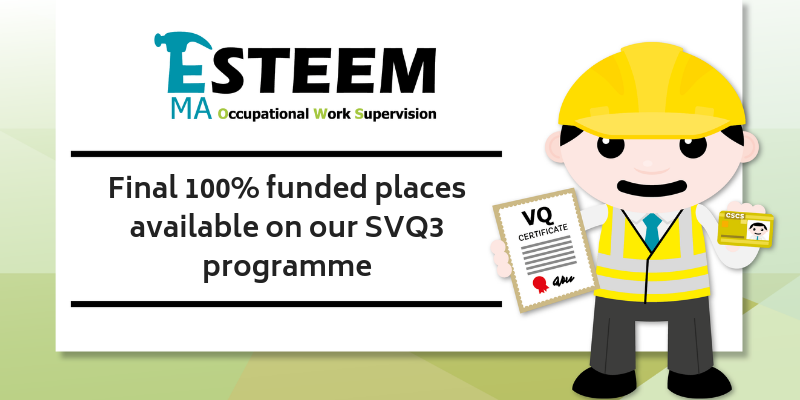 Build a confident workforce and sign your team up to our SVQ Level 3 programme today! This fully funded, SVQ Level 3 is a recognised route to a CSCS Gold Card and an excellent opportunity to develop your Site Supervisors. The programme consists of 4 half day developmental workshops which cover the knowledge and understanding part of the VQ. That’s 50% of the VQ! Candidates are also giving the opportunity to discuss in detail any questions they may have with their Assessors during their 1:1 sessions and on-site visit. At Esteem we make sure that all of our candidates are supported right from the get go. We want everyone to feel ‘esteemed’ and to have the opportunity to build confidence and to develop within their role whilst achieving their SVQ. If your company is based in one of these locations then sign your Site Supervisors up now! If you are not based around these areas but would like to work with us then please call Andy to see how we could help you. Contact Andy today to secure your Site Supervisors a place on 07766658083.